Strawberry Swirl Pound Cake - seriously delicious!!! Butter, sugar, cream cheese, eggs, flour, almond extract, vanilla extract and strawberry glaze. Can make several days in advance and store in an air-tight container or freeze for later. Everyone LOVED this pound cake recipe!! Spring is finally here! To celebrate, we fired up the grill this past weekend and had this amazing Strawberry Swirl Pound Cake for dessert. OMG! It was SO good! 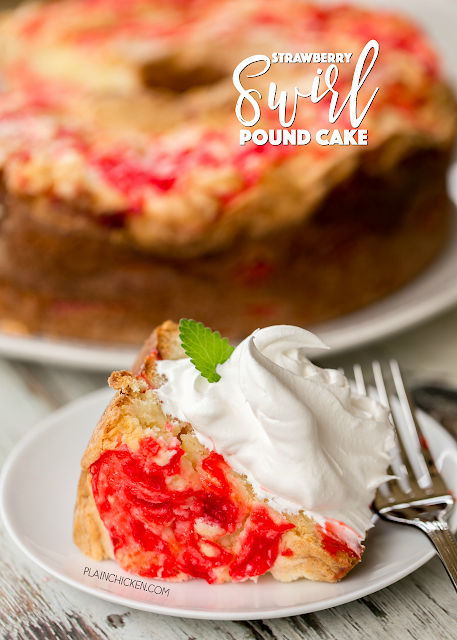 I love a good pound cake, and this Strawberry Swirl Pound Cake is one of the best. It is hard to beat cream cheese and strawberries!! 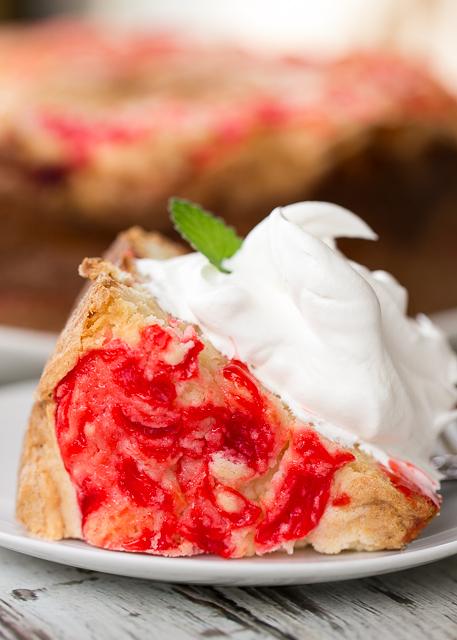 The strawberry swirl is made with a tub of strawberry glaze. I found the glaze in the produce section of the grocery store. If you can't find the strawberry glaze, I think some strawberry ice cream topping would work great. We served this pound cake with some fresh whipped cream. It would also be good with some homemade vanilla ice cream! YUM! This cake can be made a day or two in advance and stored in an airtight container. You can also freeze the cake. Preheat oven to 350ºF. Grease and flour a 10-inch tube pan. Set aside. In the bowl of an electric mixer, beat the butter at medium speed until creamy. Gradually add the sugar, beating for 2 minutes. Add the cream cheese and mix well. Add eggs, one at a time, beating just until the yellow disappears. Gradually add the flour to the butter mixture at low speed. Stir in the almond and vanilla extract. Pour 1/3 of the batter into prepared pan. Drop 1/3 of the strawberry glaze on top of batter and swirl with a wooden skewer or knife. Repeat with remaining batter and glaze. Bake for 70 to 80 minutes, or until a wooden skewer inserted into the center of the cake comes out clean. If the cake is getting too brown on top, cover with foil. Could you use strawberries that have been frozen with sugar or is the thick glaze needed instead? I haven't tried that, but I think it would be fine. I CAN'T HAVE ANY SEEDS COULD I USE STRAWBERRY SEEDLESS JAM? THIS LOOKS SOOO GOOD!! !